Hey Everyone it's Suzanne here. My turn on the Helmar Blog today so make sure you check it out and see what everyone else has been up to while you're here. Also check out the Helmar store to see what other products they sell I'm sure they will have something you'll need and your local store will surely be able to get. 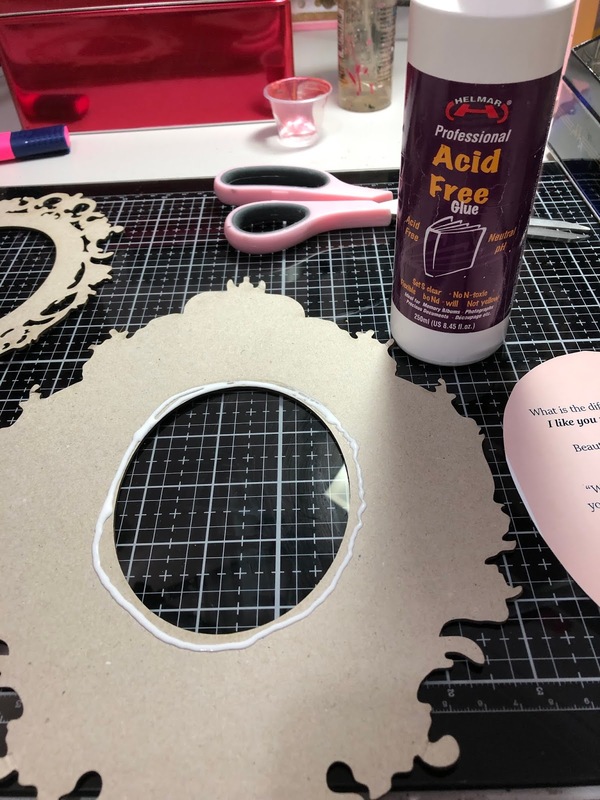 I started off with sticking down the photo onto the Antique Vintage Ornate Frame from Memory Maze Laser Cuts using the Helmar Professional Acid Free Glue. 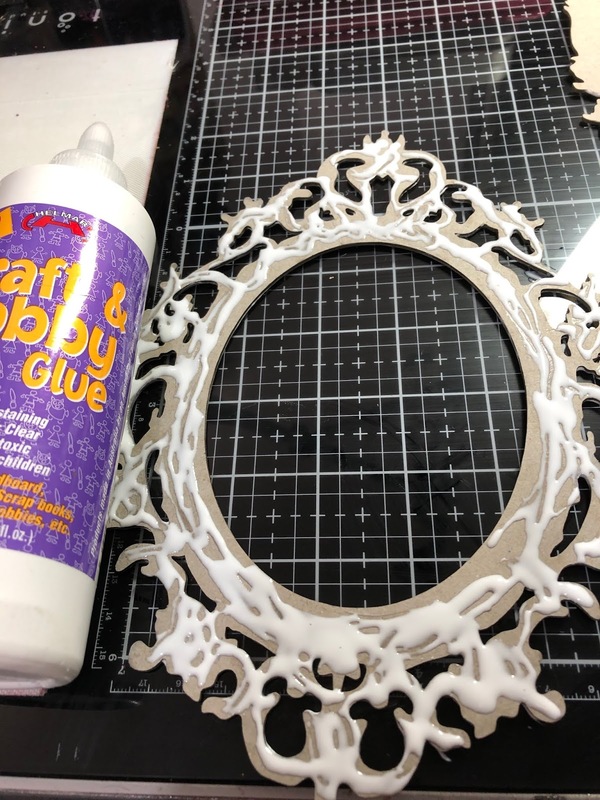 Then using the Helmar Craft & Hobby PVA Glue I adhered the two piece of the frame together. I painted some Dark Chocolate Impasto over the chipboard first then randomly painted some Rusty Paper paint by VIVA. 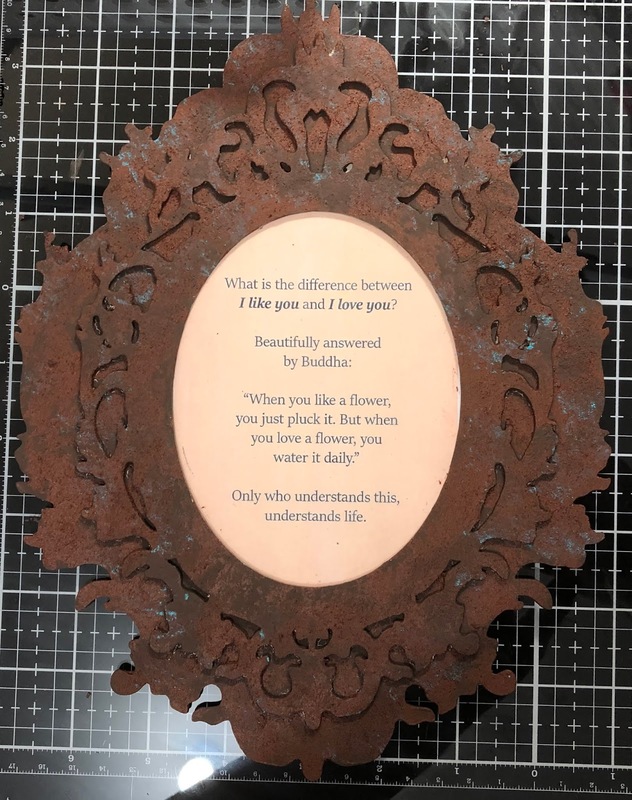 While the rust paint was still wet I dabbed a little brown through it so it mixed then added a little Art Alchemy Patina Effect Blue Paste. As you can see I used a lot of metal and I used the Helmar Premium Craft Glue to stick all the embellishments with. 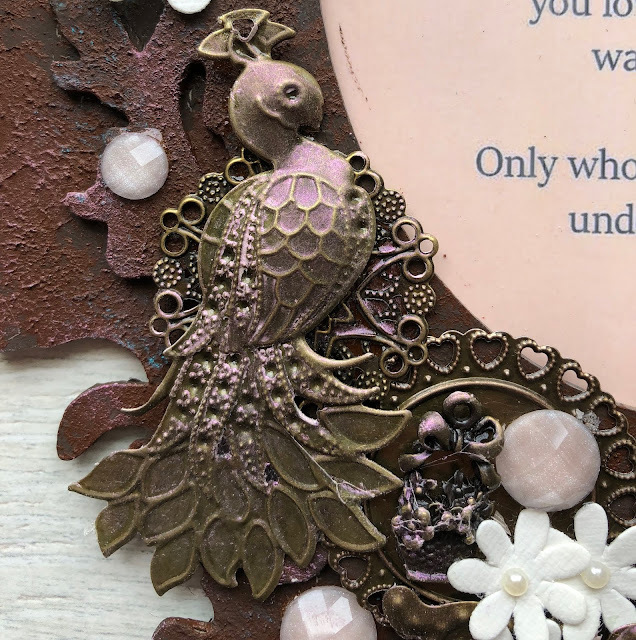 I then used some Art Alchemy Opal Magic Royal Robes Wax over the metal and a little on the chipboard just for a pop of colour. I added some Little Birdie Pearl Florettes (there always has to be flowers). 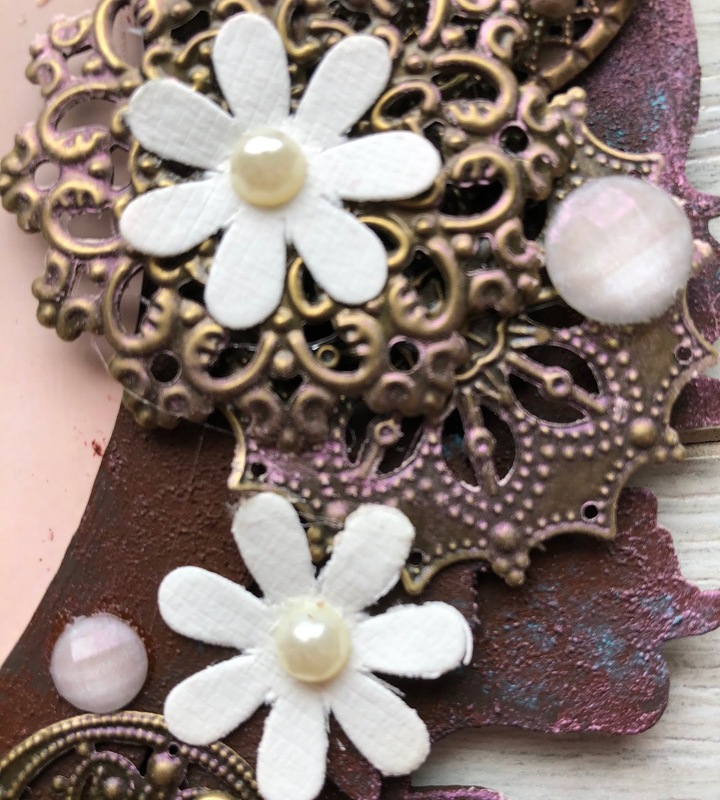 I used some Prima Say it in Crystals Lavender I used just the pink ones. And to finish it off I added a glass cabochon. Hi all Vicki-Ann here. I am an Australian Art swap member on Facebook and this time we are swapping postcards. The theme was to recycle Christmas wrapping paper on our postcards and write a quote or some inspiration for the coming year on it. I cut my card to postcard size. I received some lovely hand stamped Christmas paper that I thought was perfect for this project, that I had saved. 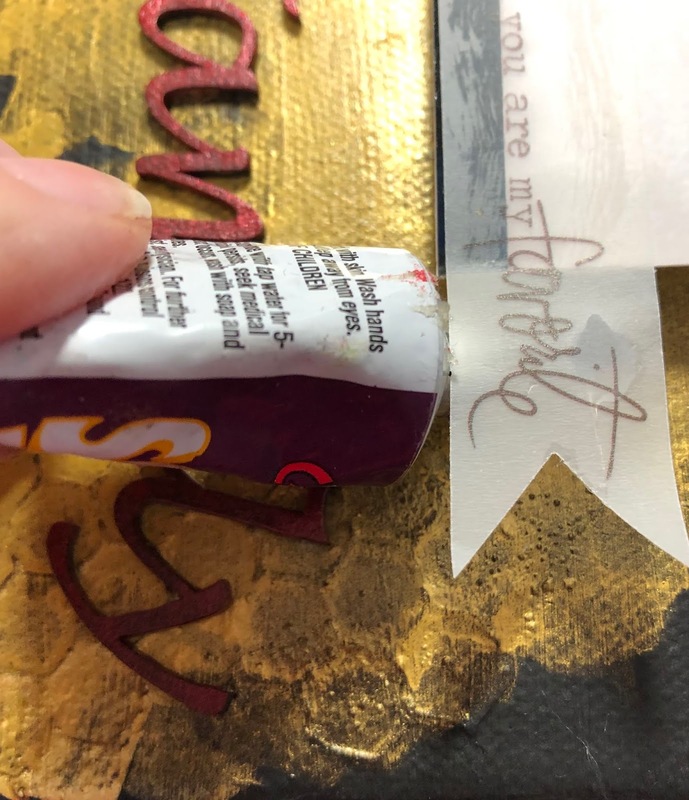 Using the Helmar Decoupage and Craft Paste, I covered my card with my Christmas paper smoothing out any bubbles. Next I decided what I wanted to go on top for the next layer. So digging through the box I decided that the sunflower was perfect. I tore some of my Nana's copied recipe and a bit of bird from some paper. I always place the pieces on top before gluing and take a photo so I can look back when gluing. So starting with the recipe piece of paper that is the bottom layer. I glued using the Helmar Premium Craft glue. Gluing and adding my layers. I coffee stained some copy paper and typed some quotes. Inked around the edges with vintage photo distress ink and added them to the postcards using the Helmar Premium Craft Glue. I posted these off last week, I hope my swap partners like them. I made a small one for me to add into a book I want to make with all bits and pieces in it. Hi Everyone, its Bridget here. Today I am sharing a project I have wanted to do for a long time. In Australia, we have very hot days. We are lucky we can hide in our air con, jump in a pool or take a cool shower, but our wildlife are not so lucky. In the hotter weather it can be a lot harder for our wildlife to find water. So leaving out some shallow bowls can save them. A bird bath also adds a beautiful element to your garden. Today I decided I wanted to make a terracotta Pot bird bath. This is very easy and fun to make. Invert and stack the pots together, starting with the largest pot on the bottom to create a stable base. Glue the pots together using Helmar's Silicone Adhesive Sealant. Then do the same with the small saucer overhanging the large saucer. While it is drying prop up the saucer with something. After it drys it sits nicely but because we often get Cockatoos visiting our garden, I decided to add a shell under it so it is a bit stronger. Now for the fun part, painting your pot. I decided to spray paint my pots so a few light sprays, letting the paint dry between the coats gave the bird bath an awesome finish in a colour I love! I decided to leave my bird bath plain, but you could add stencils, quotes or your children's hand prints! The possibilities are endless! You can paint the pots before you stack them if you wish. After it had fully dried, I gave the pots a few coats of Helmars crystal Kote Gloss vanish. This gave the pots a beautiful sheen and protects it from dust dirt and fading. Do not apply the spray to the saucers, birds do not like a slippery surface. Now all that is left to do, is add some water for the birds. So please, if you dont have a birdbath for our feathered friends on the very hot days leave a shallow dish of water out for them. Until next time. Happy Crafting! Hi crafty friends!! I hope you all are doing well and I hope that 2019 so far is treating you well. As for me, aside from spending lots of time with my grandbaby, I have come up with many projects that I intend on creating this year. 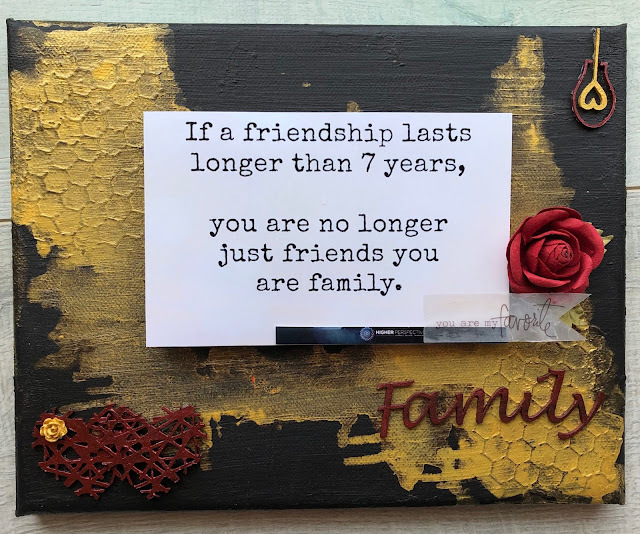 I am inspired by crafty friends, by Pinterest, and Youtube as well as other social media sites. For example, this project was inspired by a crafty lady on YouTube that I frequently watch. Her tutorials are so easy to follow. I hope that you will go check out her YouTube channel. With that said , here is one of the projects that I created using one of her tutorials. They are very easy to follow so I hope you will check out her channel!! So here is my Photo Folio Card. I used the Prima Lavender 6x6 paper pad and cut outs, & sticker. What's wonderful about this photo folio card that measures 4 x 5 1/4 , is that it can easily be mailed to that special someone in an A2 envelope. My experience has been that I try not to add too much or too thick on whatever surface that I am adhering. This prevents it from getting too wet and wrinkling your papers or your paper tearing. I do this with most of the wet glues. If you follow the tutorial to this project, please keep in mind that the tutorial was for the base of this folio. Aside from following it, you need to adhere your design paper in between some of the steps. 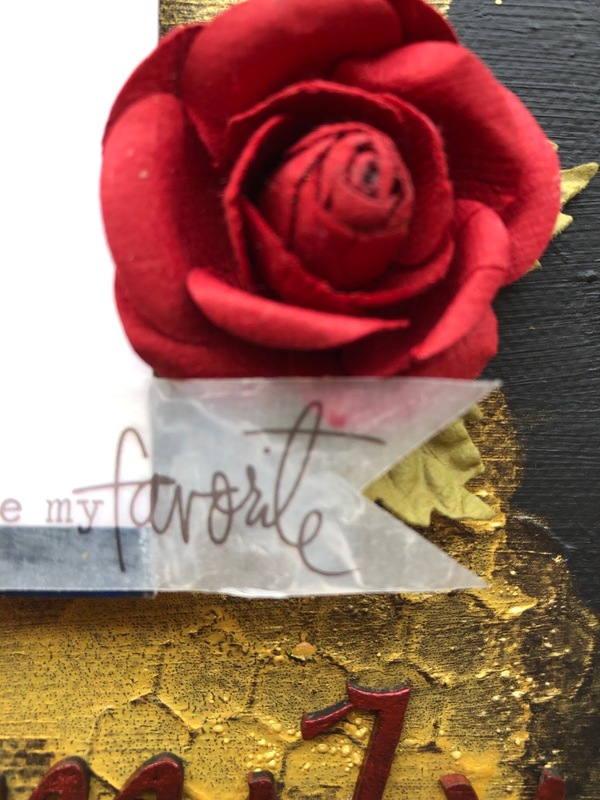 I also love using the Tim Holtz Distress Inks on some of my projects for this one I used one of my favorite ones " Vintage Photo" . I didn't use any sort of embellishment, I did however use one of the thick stickers from the Lavender collection. Also you can use a brad to make your front pocket so it looks like a clasp envelope, as you will see in the tutorial. But I chose to use a piece of velcro instead. As a final step I cut out some of the sentiments from one of the 6x6 sheets as well as some of the journaling cards from the collection as well. Hello! It’s Robyn Wood with you today sharing a vintage style, layered tag featuring Helmar adhesive that I’ve made using a bunch of items from my stash. I found a coloured tag in my stash and decided to select a few items to go with it to create a project for this month. I always have bits & pieces left over from creative sessions and I tend to keep anything that could be remotely useful. 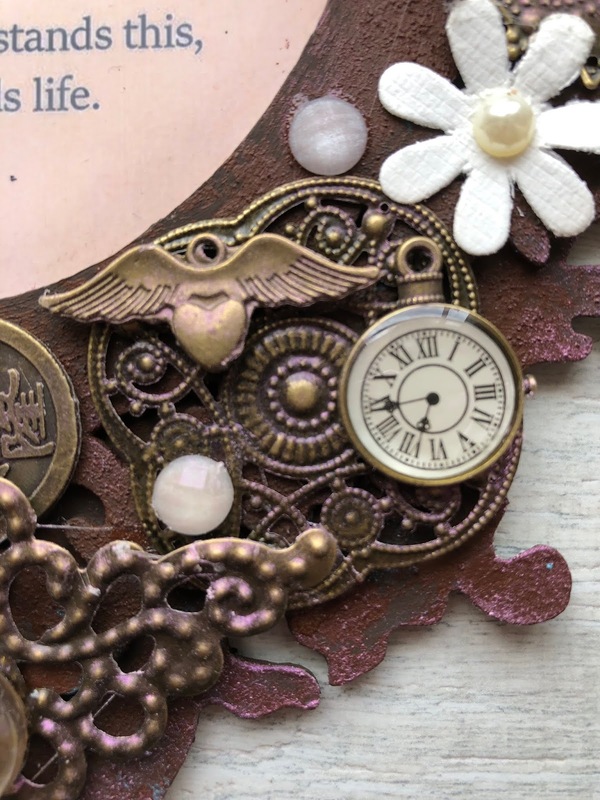 Aside from saving a bit of creative time, I find the pieces tend to spark different ideas that are often totally different from the original project! Nice & handy when the creative mojo is on a holiday. 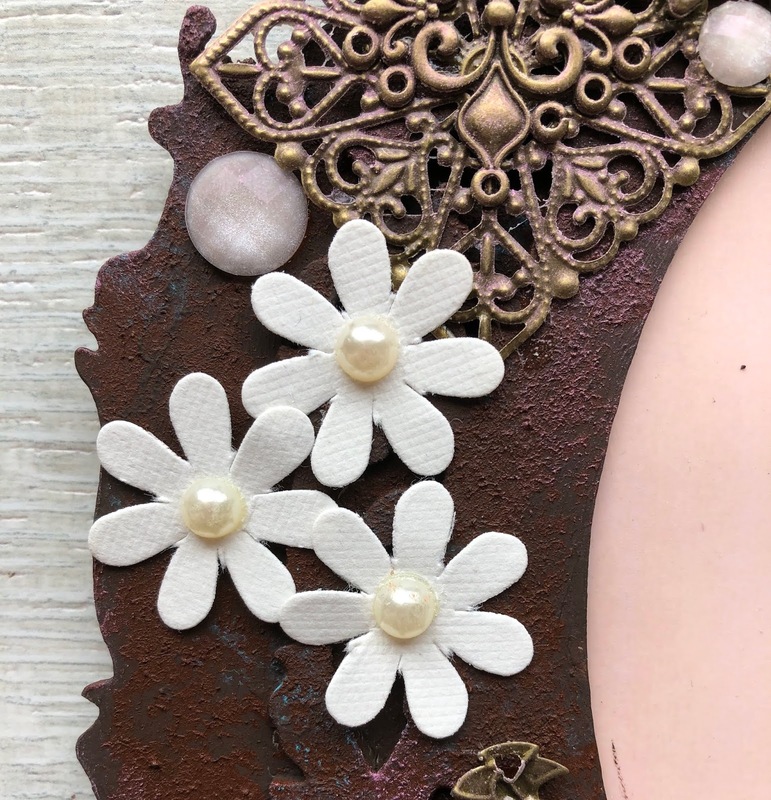 I also found this sweet pair of girls from the Tim Holtz Paper Dolls pack and decided they needed a starring roll in my project. I started by layering some papers onto my tag and adhering them with Helmar Tacky Craft Glue. The girls needed some hats to hint at their playful personalities – vintage photos always look so serious! I cut a pair of tall hats from a scrap of sheet music and coloured them before adding to the girls along with a few flags across the top of the tag. 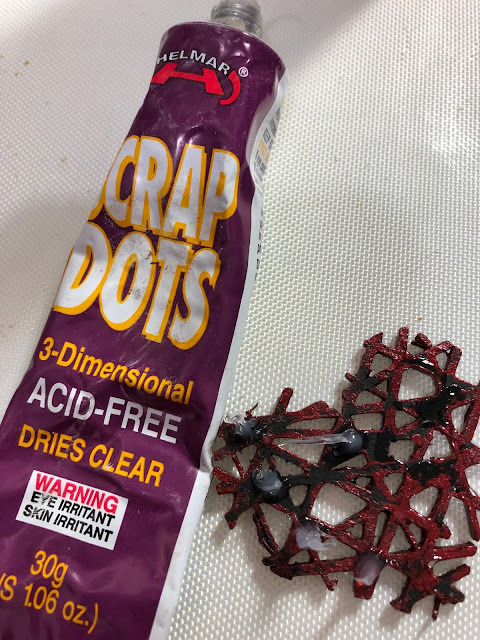 The pieces were adhered with Helmar Tacky Craft Glue & I also used a little Helmar Scrap Dots to give a few of the flag pieces some dimension. 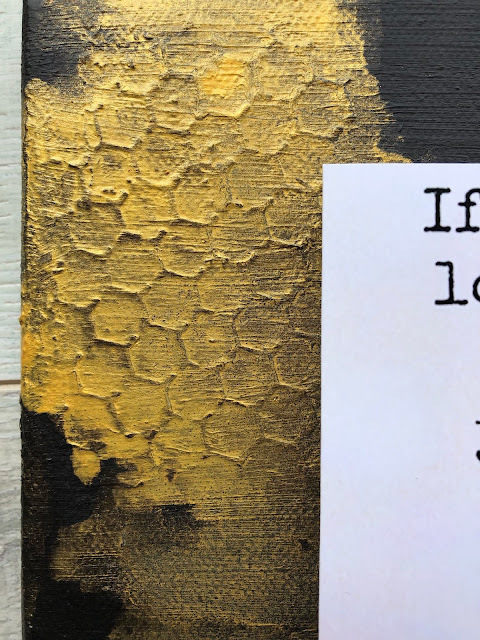 I noticed that the lyrics provided an interesting phrase for my tag, so the words were trimmed closely and adhered to a larger piece of cream paper. They were then trimmed again, leaving a small border and adhered to the tag using Helmar Scrap Dots for a touch of dimension. 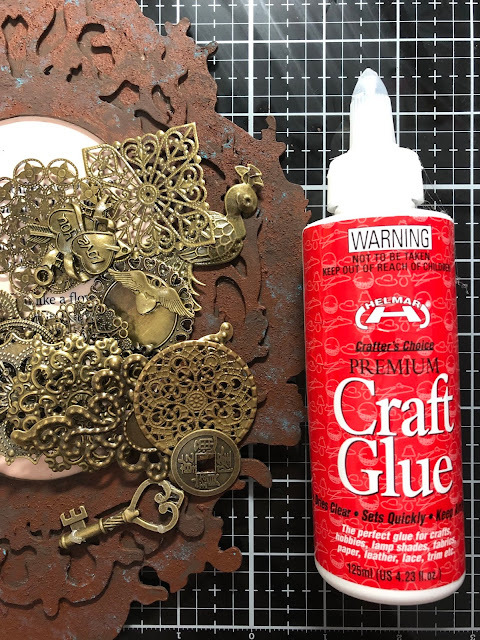 The hats needed a little extra so I spread a little Helmar Tacky Craft Glue over parts of the hats and sprinkled with Tim Holtz Distress Glitter. Using a fine black pen, I edged the tag with a think line of faux stitching. At the last minute, I decided the text paper in the background needed a little colour, so used a small sponge to ink some brown onto the background and around the girls. To finish the tag, I added a pair of buttons tied with twine to the girls hats using Helmar 450 Quick Dry Adhesive. I find that when sticking anything to a glittered surface, you need the strength of 450 Quick Dry. I started off by using a Honeycomb stencil with modelling paste. Once the paste was dry I painted the canvas with black gesso. 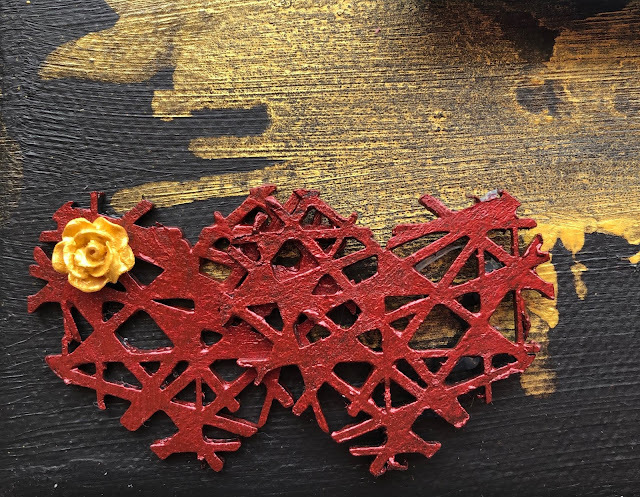 While that was drying I painted the chipboard that I was going to use with some Art Alchemy Metallique Red Wine. 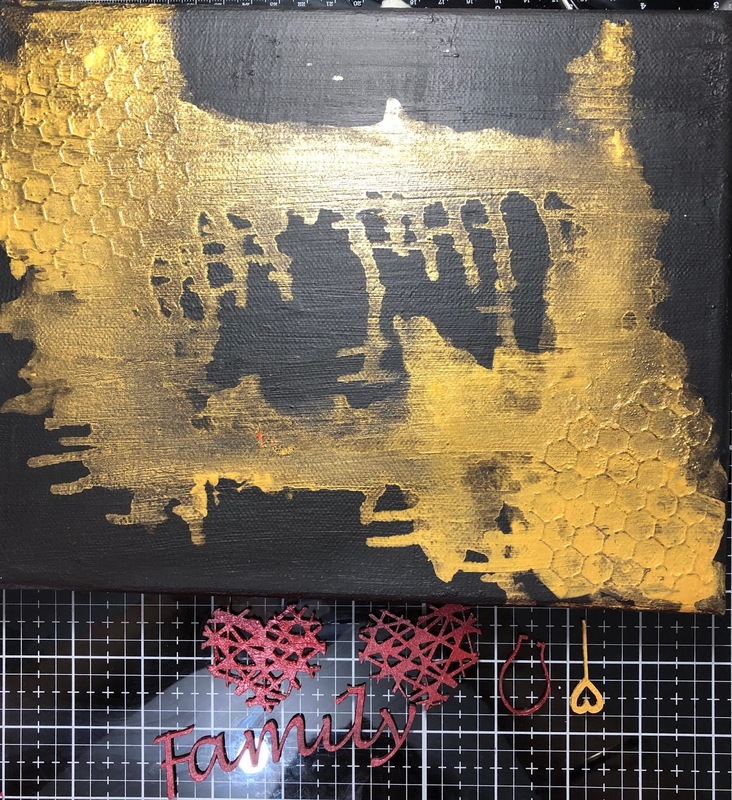 Then on the background I used the Art Alchemy Metallique Gold Rush with a bit of water to thin it out. I used the Super-Tac Glue to glue 2 pieces of cardboard together to raise the photo up. Then I used the Acid Free Glue to attach the photo to the cardboard. I used the Tacky Glue on the vellum spreading it out with my finger. Then to hold up the end that isn't on the photo I used the Liquid Scrap Dots which is great for the height without seeing it. 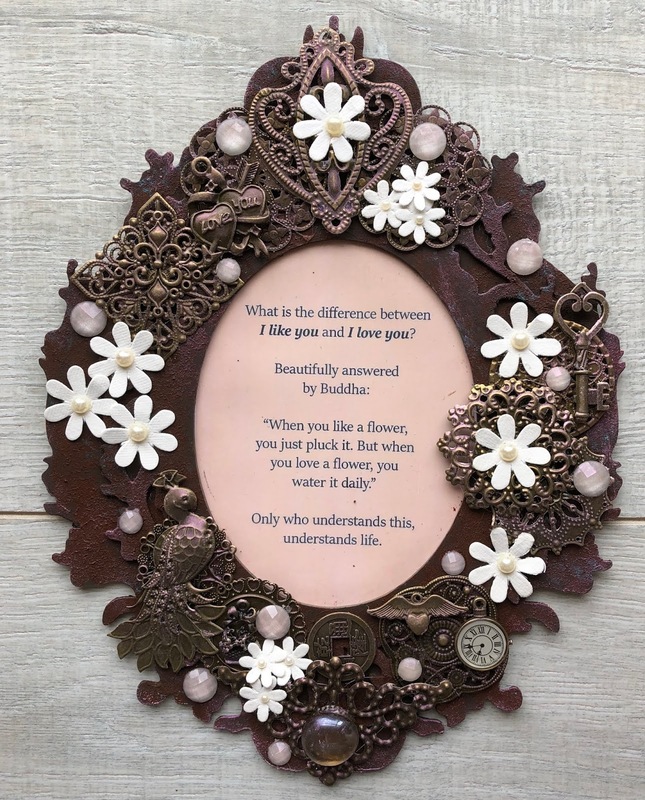 I used the Premium Craft Glue to adhere all the chipboard and the flowers down. I used the Liquid Scrap Dots on half of the second heart raise it up a little as I was sticking it onto the other heart. Tis the season for hosting parties and get togethers. Today I have a simple decor idea that will make your table settings pop. And, the fun part is, they require no sewing!! I created these with a fall/harvest theme but they could easily be adapted for Christmas or winter or even new Year's or any celebration through the year! I gathered my supplies which included burlap, silk leaves, various ribbons, buttons and of course, Helmar's 450 and Helmar's Fabric Glue. I began with a strip of burlap roughly 4 inches by 14 inches. To make the pocket, fold the bottom up about 3 1/2 inches. I creased the bottom fold a few times and then ran a bead of Helmar Fabric Glue along each side edge. 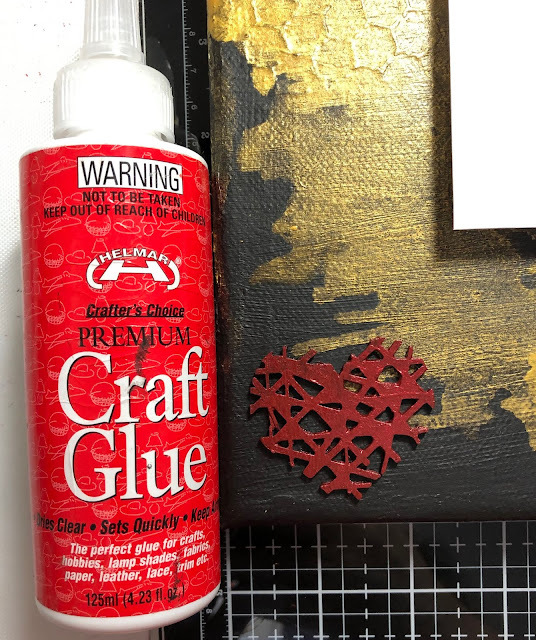 I love this glue because it dries clear, has a flexible bond and grabs quickly. Hold that pocket for a few seconds until it sets. 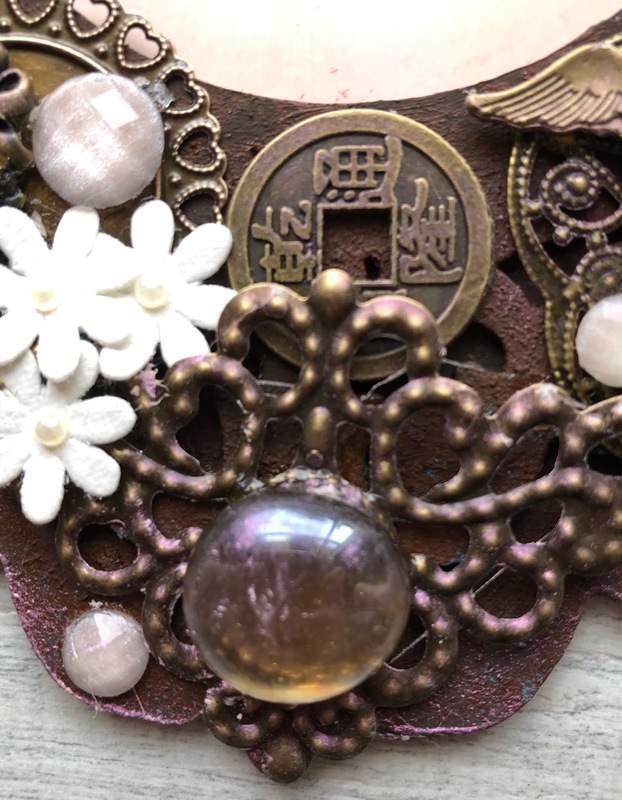 Take your embellishments and create a cluster. I used a variety of leaves, a piece of flannel, a bow and finished with a button. To be honest, I just grabbed the Fabric Glue instead of the 450 to create the cluster which worked just as well. I ended up not using the 450. Here is a close up of my cluster. If you wanted you could personalize these and use them for table settings as well. I think they will look lovely at our Thanksgiving Table. Thank you for joining me today for this home decor diy! 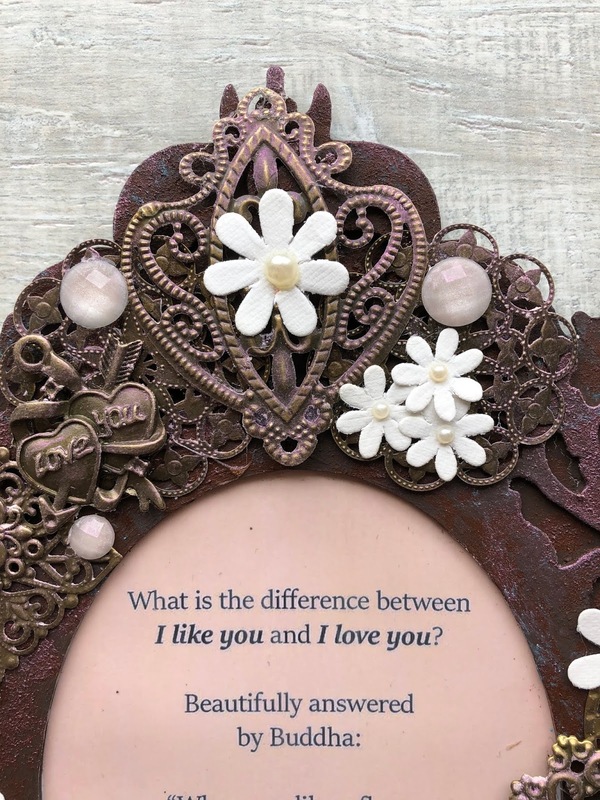 I hope you are inspired to create something similar for your table! Please click on the button up in the top right corner for information about purchasing Helmar products! I look forward to seeing you again and don't forget to check the other designer's posts every Monday, Wednesday and Friday! Hey folks Happy New Year, Tamiko here! Let me be first to acknowledge that I'm a bit of a nerd. Too uncool to be in anyone's spotlight, but not so nerdy that I have limited edition box set on Dr. Who or any other Sci-Fi related stuffage (please don't take me super serious or feel insulted, you SCI FI box collectors ::smiles and winks::) Let's check out my project. I began with first sketching my nerdy male image. I thought of the old movie Revenge of the Nerds and I giggled the entire time. I really loved that movie, I'm sure you can get it on Netflix, DVD rentals or Redbox or even Google Movies. I drew my male image on watercolor paper and gently rolled my eraser lightly, there dissolving some of the hard lines. Once my images were done drying I fussy cut them out and I stuck'em down to the monoprinted background prepared above using Helmar's Premium Craft Glue. I just love that stuff, it adheres fast yet remains flexible when needed on dried items. That means you don't have to just use it on flat surfaces! Below I show How i used the glue on the male image, the glasses and the quote that I hand lettered on some canvas fabric bits. I did some mark making with some graphite pencils and some permanent pen. I doodled some formulas that I uses for basic math calculations. Had to include E= mc squared ::giggles:: that's nerdy humor (If you got it yayy, if you didn't.. awww) ::winks:: Here below is just a small close up of the fussy cut images, lettering and embroidary twine I felt obligated to use (just for a lil pop of color). Thank you guys so much for following my project today! Don't forget to #useitupfillitup2 over on instagram and and stick it all down and hold it in it's proper place with Helmar USA!! Native Bee and Bug Hotel. Hi all Vicki-Ann here today and My husband and I have made a bug, native bee hotel for our vegetable garden. This was such a fun project! First I gathered all my pieces of wood. I have a heap of off cuts from a friend who builds stair cases. So I just looked through my pile of bits and selected them. 4 smaller pieces to make a square and one big enough to back them on. I then marked where I wanted the holes drilled on the 4 pieces and the backing board. My husband drilled the holes for me. I then ran a line of the Helmar Super Strength PVA Wood Glue along the inside edges. We then nailed the 4 pieces together forming a square. We attached the square to the backing board with a bracket screwed to the inside. The bracket is covered with all the pieces of bamboo that we cut to fit with a hacksaw and an angle grinder. Cutting all the bamboo to size was the longest part to do. We used 2 different sized bamboo. We had a bit of scrap metal so we decided to bend and nail that over the top to give it a bit more protection from the weather. I painted some chain with a hook, black. I recycled this from a hanging planter to attach through the holes at the top. You could just tie some rope through the holes and knot it. So the recommended place to hang this is under the eaves or the shade of a tree. It still needs to get some morning sun though. I wonder how long it will be before we get some bees and bugs making a home in here. It will be fun to watch and see how long it takes for them to find it. Bees do such a wonderful job pollinating my vegetable garden if we can help them in any way, I think it is worth doing. A very hot hello all of you crafting Helmar readers. Kristina here with my latest blog post, a three storey rainbow fairy house made entirely out of Popsicle sticks. I have wanted to make something like this for over twenty years, I honestly just never had the right glue for it. The first time I used Helmar's Premium Craft Glue, I realised this was the glue that would do everything I wanted for my fairy house. So let's begin!! Glitter, your choice of colour. Dremel (not required, was just handy). Lots of decorations, like small flowers, rhinestones, xmas beads, anything your imagination desires to decorate the house. Cotton wool balls unpeeled for the roof as snow. Some wood for the base, or you can make the base from Popsicle sticks. I used Ply wood. To begin with it is necessary to glue together the popsicle sticks and let them dry. I started by gluing two sticks together, then when they were sturdy I glued them to another set of two popsicle sticks as shown below. 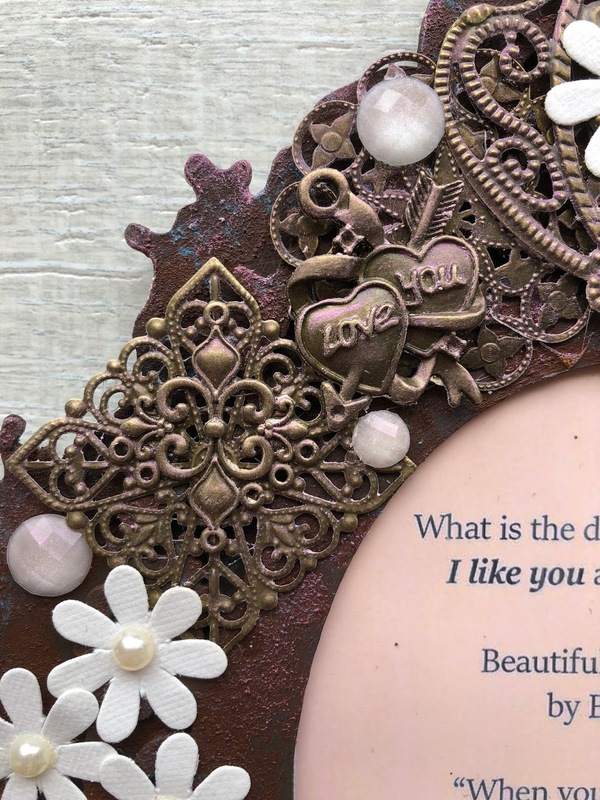 I used Helmar Premium Craft glue for this and most of this project. It dried so quick, I had no problems with walls falling down. I was actually so happy. The amount of sticks you need to glue together will depend upon the size of your base board. I also rubbed some of the wood glue on all the panels of the walls just to give them the extra strength that the wood glue should give. It worked like a charm. Once you have the required amount of sticks glued together to fit the base board, go ahead and make your design. I cut out one window before I glued that wall on to the base, and I decided where my front door would go. I used both Premium Craft Glue and the Wood Glue to adhere the walls to the base. The whole process is gluing all the sticks to the base board, and cutting out the windows required and making the door. To make the door I just left a gap of about 6 Popsicle sticks, then I glued three sticks on one side slightly open, and three on the other side even more open. Using the Premium Glue for the initial bond then the wood glue for the strength. After the base seemed dry enough, about 2 hours, we are very hot here in Australia at the moment, so in the colder areas it might be a longer wait. I began the roof/second storey floor. 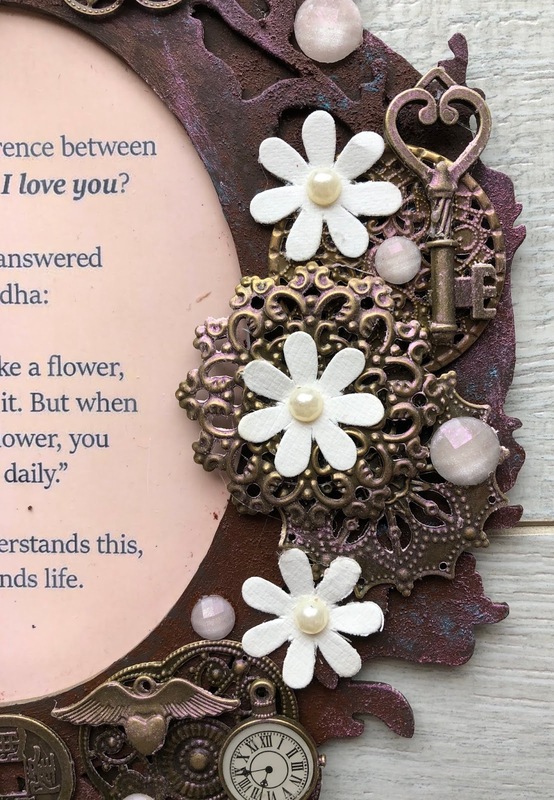 It is the exact same procedure as I did for the walls, the only thing that needs to be thought about is it you want a verandah and where you want that to be. Just so you can make sure that you have the sticks overhang in that spot. Much easier to do it now, than later. For the roof I glued two sticks across the row that was glued together, just to keep them straight and give them more strength, as pictured below. I wanted a large verandah on both short edges so I made my overhang quite large. I put Premium Craft Glue and Wood working glue onto the roof and stuck it on to the bottom level. Then I just began the second storey the exact same way as I did the first. Just make sure you plan your windows and doors. Almost finished the building part, and then on to the imagination part, the decorations!!! For the top of the second storey walls I used a firm but light weight cardboard (the insert out of a soft drink box). I glued this on, and the final part of the house building is upon us. I wanted a pointed roof, but if you want a different kind of roof, go ahead and do it!! I used Helmar Premuim craft glue to join two sticks together. I did approximately 20 pairs, because I calculated how big I would need the roof by counting the sticks on the second storey. 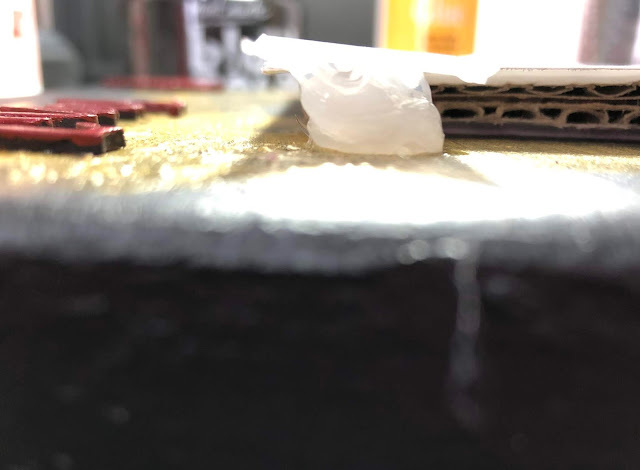 I put glue on the base and top of two sets of two sticks, leaned them on an angle on the roof cardboard and added some woodworking glue to ensure it's strength. The picture below shows the angle of the roof. I just followed the step of gluing sticks to another two sticks until I reached the end. Now for the time to let your imagination go wild. Decorate the windows with any trimmings you want. I used Helmar fabric glue to make the curtains and to glue them to the house. 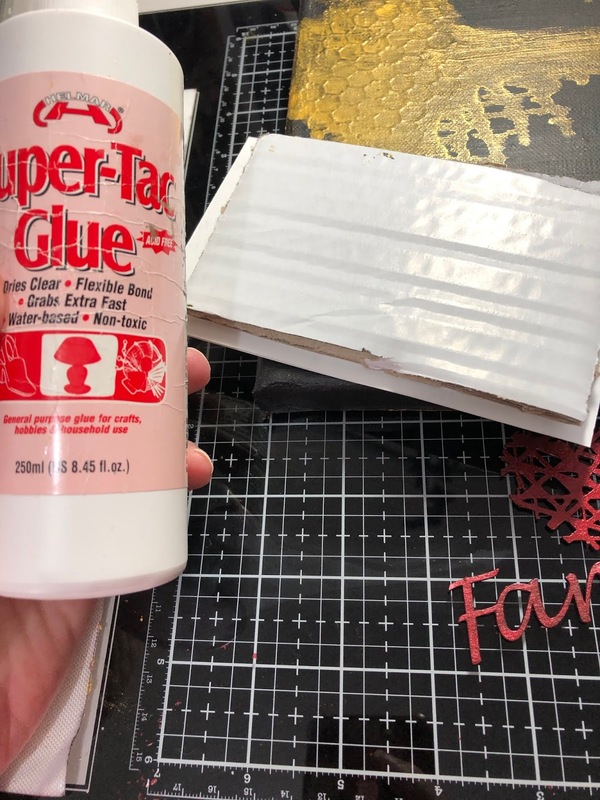 Anything that requires fabric I do recommended using the fabric glue, it just works so amazingly well. I made this verandah fence just by using off cuts and gluing them across the verandah. I did warn the fairy involved that I am not a certified builder and it may not be amazingly perfect, luckily she is a hippy fairy and didn't much care. Yes I have made up a whole story about this fairy as it helped me to decorate her house. I used Helmar Gemstone Glue to apply the door knobs (large rhinestones) and any other beads and gems I wanted applied. No my fairy has not lost her legs lol, she is just sitting down. She's a hard working woman! Curtains and gold embellishment glued on with fabric glue. Go crazy....have fun.... go overboard! I did. I have made a YouTube video on the whole process of the making of this fairy house. Just one last note, while making this fairy house my two youngest boys seemed to hover a lot over me. Then they saw my stash of wood and embellishments and they just started to glue and glue and design their own houses. We all had so much fun sitting in my garage just building our houses, it was a great family night in. They are both so proud of their houses, they too used Helmar glue. So sit down with your kids, grandkids, dogs (yep my pugs definitely had to sniff and knock over everything) and have a wonderful and memorable day with Helmar, creating a fairy house. 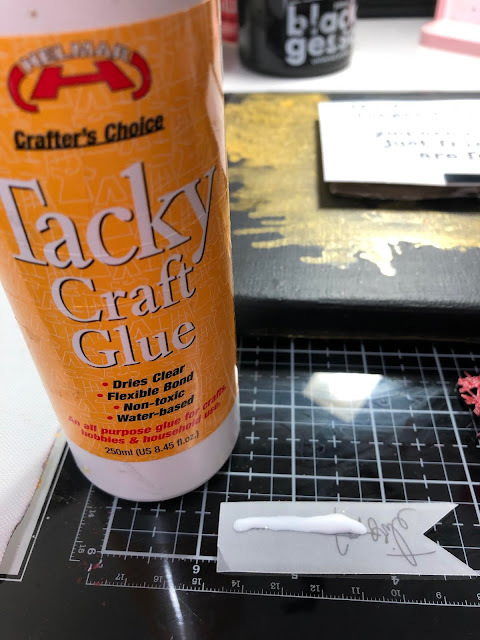 I am so thankful for the Premium Craft Glue, I couldn't of done this house without it! Here are my wonderful boys and their awesome creations! So proud of them. Thank you for reading, watching the video of the making of this fairy house, and I cannot wait to show you my next project.